Location: Sorn Castle is a renowned privately owned estate in Ayrshire, Scotland. About your host at Sorn Castle: Jamie and Jemma McIntyre, Owners. Sorn Castle is currently the home of Jamie and Jemma McIntyre. Having grown up at Sorn with five brothers, Jamie met Jemma in London where they enjoyed a full and busy social life. They married in 2008 and having moved to Sorn Castle shortly after, together they continued with their mission to host and entertain which is the philosophy on which the castle has grown. Sorn Castle has evolved over the centuries with entertaining guests at the forefront. The estate and castle provide a wonderful backdrop and special platform to gather people and celebrate in style. Whether through private hire of the castle or enjoying the views from the adjacent marquee, the grounds of the pink castle provide the perfect sanctuary to host any occasion. ­­­­­­Game shooting experience at Sorn Castle: Whether you are with us for a day to shoot or to enjoy exclusive use of the Castle for a weekend house party, our team ensure you are looked after from the moment you arrive. 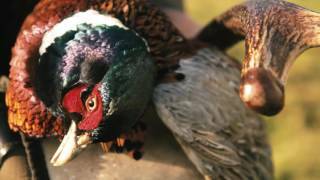 The pheasant and partridge shooting at Sorn Estate is set in amongst 8,000 acres of the rolling landscape. Since 2008 when Jamie took over the running of the estate, much landscaping and forestry has been done and Sorn Castle’s shoot is fast becoming internationally renowned for offering sporting birds and first class hospitality. Both driven and walked-up days are available. Much of the topography at Sorn lends itself to shooting activities and there are a number of challenging and exciting drives to experience. The driven shooting is run within the core of the estate, surrounded by what is fondly referred to as ‘The Four Farms’ and the castle itself. Sorn Bank and The Cleuch have been referred to as the two signature drives on the estate providing really good quality high birds, along the line. Click here for quick link country guide. A full driven day provides eight guns the opportunity to shoot pheasant, partridge and some duck on many of our excellent drives. The birds are very sporting and we can accommodate between 100 – 250 bird days. As well as enjoying the scenery and challenging sport, your day will include home made elevenses in the field to keep you warm and nourished until a generous and hearty lunch which is served in the castle. After the last drive, the party will return for tea and cake whilst the bag is being counted and the guns cleaned, ready for your sweep to be announced at the end of the day. To select and book the top suggested hotels and accommodation in the area when shooting at Sorn Castle, click here. by car or public transport to Sorn Castle.